Green Biologics Ltd (GBL), an Oxfordshire biotechnology company, was awarded £560,000 (US$1.1 million) to boost 'green' fuel development, specifically biobutanol, with £250,000 (US$500,000 ) funding from the Department of Trade and Industry-led Technology Program and £310,000 (US$610,000) from shareholder investors and business angels. Butafuel™, their patented biobutanol, is an advanced transportation biofuel based on butanol. Butanol is derived from waste plant material (cellulosic biomass) offering a more sustainable and environmentally friendly future. Biobutanol is produced by the clostridial fermentation of starch and sugars, a process first commercialised in 1916 to produce acetone for munitions for the war effort but which was displaced in the 1950s by a cheaper petrochemical method. GBL plans to develop a way of manufacturing biobutanol which will slash the cost of production by up to a third. Biobutanol is currently used as a chemical feed for stock but high production costs have prevented it being widely used as a fuel. Butanol is a liquid fuel that can be readily integrated into the existing fuel infrastructure, it has a high energy yield, similar to gasoline; low vapor pressure and can easily be stored, handled and transported via pipelines. Technical development is supported by a microbial platform technology based on a unique and proprietary collection of heat loving micro-organisms (thermophiles, shown left) and thermostable enzymes that operate at higher temperatures than other industrial micro-organisms. Natural thermophiles are found in solar-heated soil or sediment, warm process effluents and biologically self-heated compost. GBL has isolated thermophiles from a range of compost environments and has built a library of these micro-organisms capable of converting waste plant material into valuable chemicals. Of particular interest are the liquid biofuels for transportation, ethanol and butanol which unlike fossil fuels, are renewable, CO2 neutral and don’t contribute to global warming. Thermophilic microbes and thermostable enzymes are robust, faster, more effective and cheaper than conventional microbes operating at ambient temperatures. The Company's platform technology has been specifically developed to address a range of environmental, industrial and pharmaceutical applications. 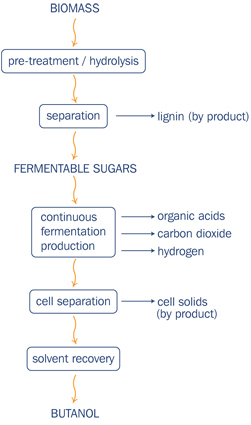 GBL has isolated a cocktail of thermophiles for rapid enzymatic hydrolysis and release of fermentable sugars from biomass. GBL plans to integrate its patented hydrolysis technology with its prorietary biofuel fermentation process offering a reduction in both feedstock and manufacturing costs. Green Biologics is partnering with EKB Technology, a specialist in innovative process technology, to develop an advanced fermentation process for butanol with improved yields and productivity and to demonstrate lower production costs for its Butafuel(tm) product. BP has recently announced (previous post) a collaboration with Dupont and British Sugar to manufacture biobutanol using conventional technology in the UK. BP provides a route for butanol into the transport fuel market and aims to blend butanol with petrol at its 1200 filling stations. In addition, in an attempt to curb C02 emissions, the EU has suggested that biofuels should account for 5.75% of total fuel sales by 2010. More recently the Commission has proposed that biofuels should make up 10% of total fuel sales by 2020 which represents a huge increase in the market for biofuels. Green Biologics Ltd, a profit making private organization, was founded in 2003 by Dr Edward Green, Chief Executive Officer, and is located at Milton Park, Oxfordshire. Green Biologics is an industrial biotechnology company aiming to become the world's leading supplier of advanced fermentation techniques for conversion of lignocellulosic plant material to renewable biofuels and chemicals. See this presentation for additional information about the company and their buisness model. Great to see so many new inventions on reducing waste and converting it into energies. hope it will blossom! E.I.Dupont is already heavily into biobutanol. the company's growth plans in the rapidly growing biofuels industry. This is where the ethanol money should be going. I wonder how the BP revenue mix will change oil/solar/other alt energy-biofuel over the next few years? If they really do have an organism that produces butanol selectively, that would be something. Their website omits any mention of a pilot plant, though, so even if they have it working in the laboratory today, it is probably several years from everybody's gas pump. too, gonna be really interesting, also re. investments. Lucky for us there are better ways to make bio-butanol than the ABE method.